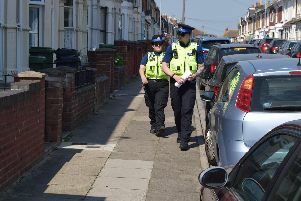 Police have arrested a man on suspicion of attempted murder after a woman was stabbed multiple times at a property in Shoreham last night. A 32-year-old man handed himself into a police station in Slough at lunchtime on Wednesday, confirmed police. He has been detained on suspicion of attempted murder and taken into custody, police said. Officers were called to a property on Sussex Wharf on Shoreham Beach around 8.15pm last night to a report a woman had been stabbed multiple times. A 36-year-old woman was taken to the Royal Sussex County Hospital in a serious but not life threatening condition, said police. Residents on the Beach reported numerous police cars at Sussex Wharf, with a search helicopter circling overhead. Detective Inspector Chris Leech said: ‘A man has been arrested in connection with the attempted murder of a woman in Shoreham.